Brian users can exchange session data via the use of export/import files. Brian will generate a file of session data. Another Brian user can import that session file and load the data to his database. Only one session can be contained on a file. All personnel for a session are loaded for every song on the session. Even if the originating database had various artists sitting out some sessions, the receiving database will be updated as if all players were on every tune. The receiver will need to make corrections after the import. Issues are not included in the exchange. To export a session, first display the session in the Sessions window. Once the correct session is displayed, press the Export button. A save dialog box will display for the user to name the export file. Press save and the file will be created. Once the file is generated, it must be transmitted to the importing user. Email attachment is generally the best. Once a data exchange file is received, it can be imported by using the Import Session item in File menu. A dialog box will appear for the user to select the correct file. Once that is done, Brian will parse the file and display the data on the XML Import window as shown below. Brian will evaluate some session components to see if they are already on the data base. The Date, Venue, and City fields are not checked. But the Label, Session Type, Songs, Composers, Instrument, and Personnel fields are checked for existence in the database. Any item that is not found will be displayed in red type. If the importer presses the Load button, any entries displayed in red will be created in the database and then Brian will proceed to create the imported session. But the user may decide that the not found entries are actually there but not as the import file has them listed. 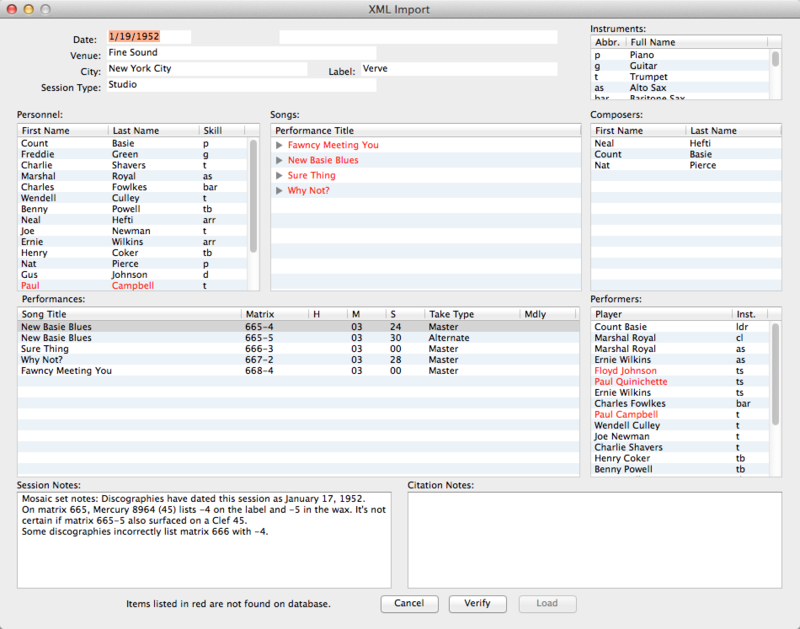 Any entries in the Personnel, Songs, or Composers lists can be double clicked and then edited.